The multitude of residential garage door styles can feel overwhelming when you’re looking for a replacement or a new installation. A garage door can make or break a home’s curb appeal, either making it blend into the street or neighborhood or helping it stand out in all the best ways. 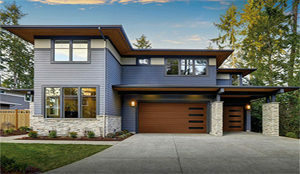 Are you wondering: Which style of garage door is best for my home? If so, here’s a look at some popular options and how to choose a garage door style that’s best at your house. Panel models are the most common among traditional styles of garage doors. You’ll find raised panel garage door options can look fantastic without making too much of a statement. You can also customize a traditional raised panel garage door to help it stand out. Choose a unique material, pick the perfect stain or paint color, add windows and more. Each of these small additions can help create the perfect raised panel garage door for a traditional home. 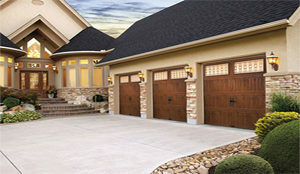 Carriage house garage doors are best suited to colonial and Victorian-style homes. These doors harken back to a time before cars when homeowners would store their carriages in small houses adjacent to main homes. 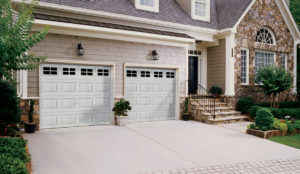 Today’s carriage-style garage doors offer the look of swing-out doors but with the convenience of upward operation. Carriage house doors allow you the opportunity to select hardware and make many other choices that can enhance your garage door selection. Do you have a modern or contemporary home? If so, you may find that modern and contemporary garage doors are a good fit. Many of these garage doors are made of aluminum and glass, which lets you customize the amount of natural light and degree of privacy that is best for your home. You can also find steel options that deliver a contemporary feel. Just make sure you have the style of home that’s best suited for the contemporary style of garage door. The material makes a huge impact when you’re considering residential garage door styles. Steel is a common material, preferred because of its durability and strength. But many homeowners fall in love with the look and feel of natural wood, which is perfectly understandable. Natural wood helps a home stand out on its block or in its neighborhood. Yes, natural wood garage doors do require a little bit of maintenance, but they can greatly enhance the curb appeal of the right home. Are you wondering how to choose a garage door style? At Ole and Lena’s, we can help homeowners assess their garage door options and make the perfect selections. A garage door is so important to the way a home stands out on its street. Make sure your home makes the statement you want it to when you trust Ole and Lena’s for a new garage door. Contact us today about how we can help enhance your home through a new garage door.